recollection * and with the spirit of holy prayer. V. St. John the Baptist, precursor of Christ,! R. Pray for us. V. St. John the Baptist, shining lamp of the world,! R. Pray for us. V. St. John the Baptist, angel of purity before thy birth,! R. Pray for us. and that are led astray by vice. V. St. John the Baptist, intrepid preacher of truth,! R. Pray for us. V. St. John the Baptist, voice crying in the wilderness,! R. Pray for us. V. St. John the Baptist, miiracle of mortiﬁcation and penance,! R. Pray for us. the teachings of Jesus (☨) Christ, * our divine Master. V. St. John the Baptist, example of profound humility,! R. Pray for us. V. St. John the Baptist, great defender of holy matrimony,! R. Pray for us. 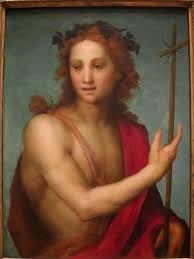 V. St. John the Baptist, glorious martyr of zeal for God’s holy law,! R. Pray for us. in the unity of the Holy Ghost, one God forever and ever. may gain: (1) an indulgence of ﬁve years once each of the days; and (2) a plenary indulgence on the usual conditions,iracle of mortiﬁcation and penance,! R. Pray for us.